"Dark Trinity" - Part 6: "Darker Days"
Redhood finds himself at gunpoint, with Black Mask having the upper hand. Artemis fighting Bizarro is not faring to well. Distracted by the battle between Artemis and Bizarro, Black Mask takes his eyes off Redhood, allowing him to kick Black Mask down. Redhood reveals to Black Mask that he will soon lose control of himself as the techno organic virus drives those that use it go crazy. As that happens, Bizarro also regains control of himself. Black Mask begs for the cure, but Redhood refuses him and walks away. The trio regroup, and Redhood offers to help Artemis find the Bow of Ra. Artemis reluctantly accepts, and the trio form an unofficial alliance. Several days later, a mysterious figure pins photos and articles to a wall, piecing these together and finding a link to the to the Dark Trinity. We end with Redhood looking over at Gotham City from the outskirts, as Batman pulls up in the Batmobile. The two talk, and end the night unmasking and having a couple of burgers. Story - 5: I know a lot of people hate Scott Lobdell's writing, I've read everything from people calling him a hack to others saying he only has a job because of his friendship with some higher ups like Jim Lee. My personal feeling towards Lobdell's writing is that he tries to think outside the box, and attempts a new take on familiar characters. Sometimes this works and sometimes it falls flat. Personally I wasn't a fan of his Teen Titans run, but I have enjoyed his Redhood and the Outlaws work, (Aside from ideas about Starfire). 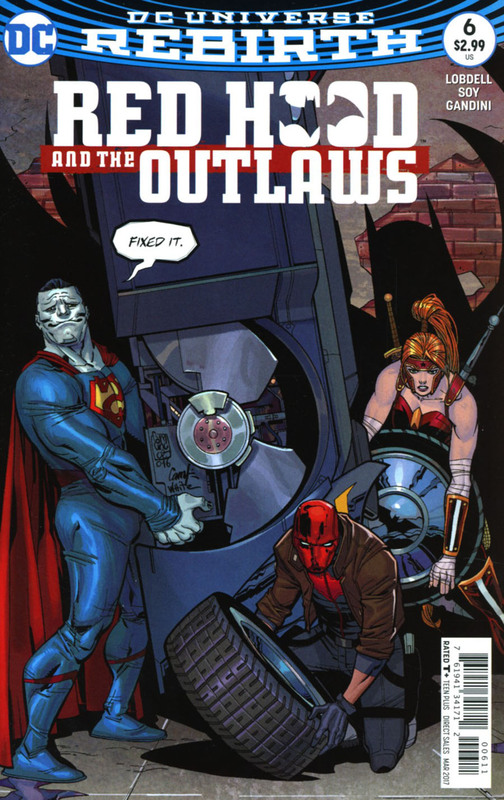 Lobdell ideas did lead to some interesting story ideas, and Redhood and the Outlaws is one of those very things. I love the concept of this "Dark Trinity". There is so much possibility, and I am excited to see what comes next. This was a good introductory arc to this new Outlaws team. With this issue being the conclusion, I love that this group has been tried and tested, and now are ready for whatever comes there way next. I'm excited to see where the direction of this book goes next. If you haven't been reading this book, please pick up the trade and give it a go, it's a good read. Finally, who could the mystery man be that's collecting data on the Dark Trinity? My first guess was the Joker, judging from the gloves and suit jacket. The colors may be off, but my money is on the Clown Prince of Crime! Art - 5: Dexter Soy... What more can I say about this man's art that I haven't already? Absolutely gorgeous! It really fits the tone of the book. There is a slight Anime look to the art, with the stark shading giving it a gritty look. I can really see this book as a CW TV Series. Soy knows how to work the shadows to be more impactful, and can work the subtle moments like the last page of Bruce and Jason having a couple of burgers with Gotham in the background. Soy has a good grasp on Jason as Redhood for sure, but his Batman is quite impressive also. Again he has an Anime style, but it's not too jarring that it doesn't fit a character such as Batman. In fact, Soy's style also fit Superman quite well too (from issue 2), so I do look forward to the day that the actual trinity show up in this book. This entire book is a perfect marriage between a writer and an artist. I really want to see more from Soy, so I really hope that he remains on the title for a long time to come. Cover Art - 5: The main cover is a good call back to when Batman first meets Jason Todd, as he tries to steal the wheels off the Batmobile. This one is comedic, but it's funny because of Bizarro. The variant is a much cooler cover though.